Ok, a week ago I had a snow day and was introducing my new Phonics "Ph"riends packs. You can check out those packs in this post by clicking HERE. At the end of the post I said I hope the weather looks a little more like spring next week than it did that day......well, guess what.......it did!!!!! Brace yourself because today...........yes, today..........the sun ACTUALLY CAME OUT!!!!! That's right!!!! I saw it!!!!! And the temperature was in the 40's. So, it did look, and feel, a little more like spring one week later. Have I mentioned that I REALLY WANT SPRING!!!! I am craving warm weather!!! 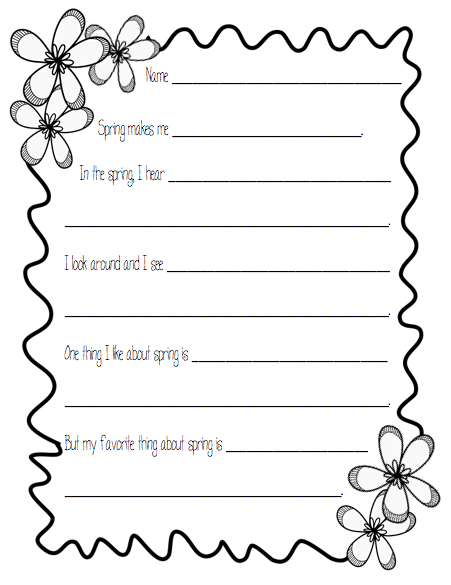 So here's a cute little activity we did and you can download the writing that goes with it at the end of this post. First of all, I LOVE TARGET!!!!! I bought these adorable foam egg pieces at Target for $5.00. There were like 40 sets in the pack and you could mix up the colors. Sooooo cute! I wasn't sure what I was going to do with them and then this idea "hatched". Ha ha!!! Did you catch my play on words??? Ignore the corny comments - I think I have Spring Fever! 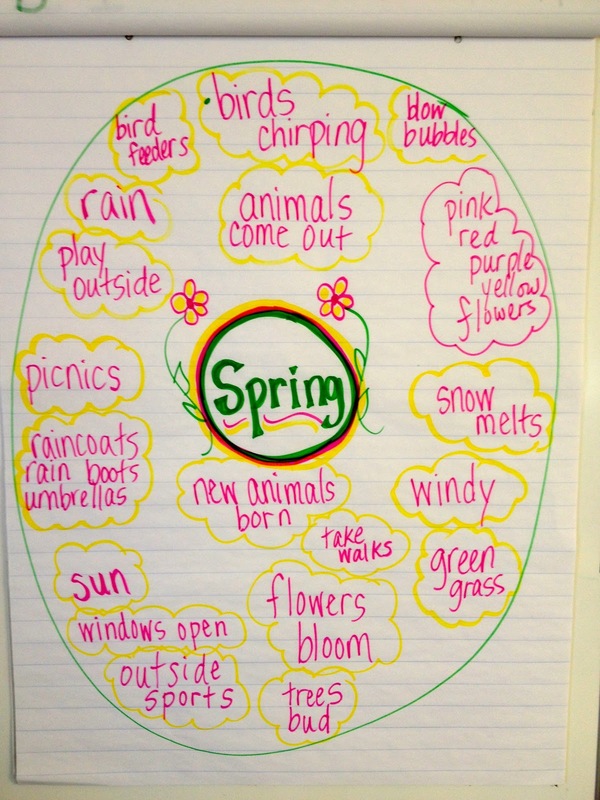 So then we moved onto the writing about Spring - what we hear, what we see, and of course, what we like about Spring. Click on the picture below to grab your copy. There are 2 versions of this writing paper because I did a rough draft first and this one pictures was the final copy. Finally I took picture of the kiddos and told them to put their hands up like they were hatching out of an egg. Some of them were hysterical!!! 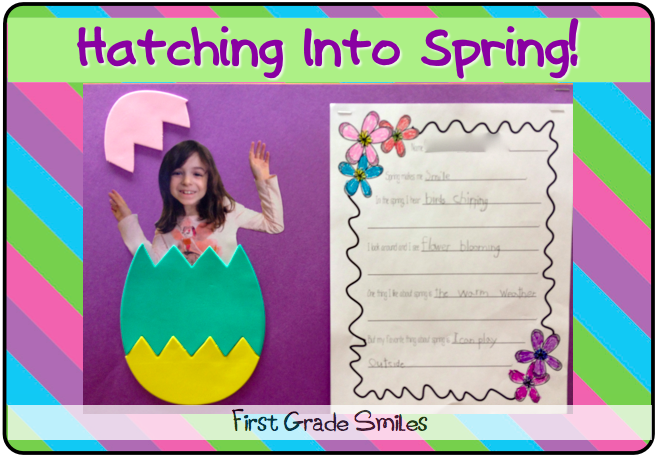 I hope you might be able to use this little freebie in your classroom and more importantly I hope you can grab those adorable eggs from Target to complete the project. I loved the way they came out!! Happy Spring everyone --- those of you down south, keep sending the sun and I'll try to keep sending out some freebies!!! Oh wow! Super cute idea! I am with you on the anchor charts...I don't how to do them either. By the way, yours looks GREAT!! Thanks for the freebie! I hope to use it when we come back from break...we are off next week. I also need Spring (MI)! It's unseasonably cold here this year!! 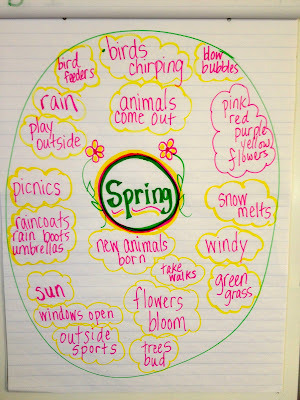 Your Spring chart looks AWESOME! Borrowing that idea! 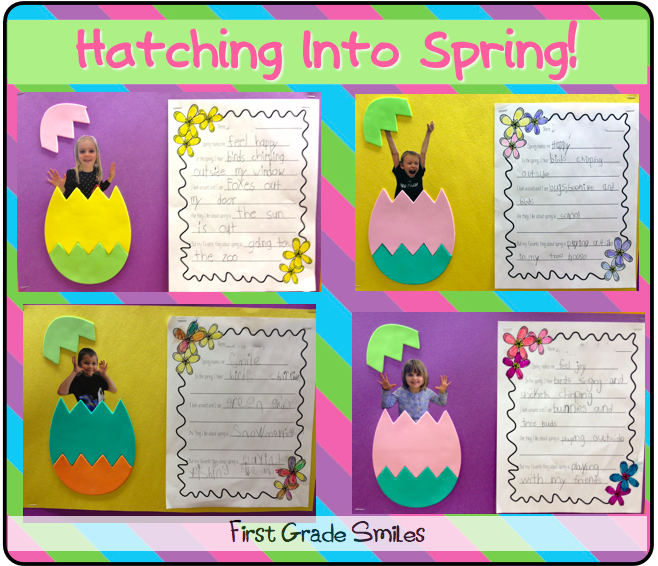 And how cute are your springing chicks!! LOVE that!